While John F. Kennedy, who would have turned 100 on Memorial Day 2017, is known throughout the world – nearly as much for his glamorous lifestyle as for being the 35th president of the United States – he is also remembered on Cape Cod as the driving force behind the creation of the Cape Cod National Seashore. Through his foresight, more than 44,000 acres of open land have been preserved forever. The Seashore is spread among six Cape towns: Chatham and Orleans, with most of this land only accessible via off-road vehicle, Eastham, Wellfleet, Truro and Provincetown. Of the latter four towns, Eastham is the closest to the Seadar Inn. 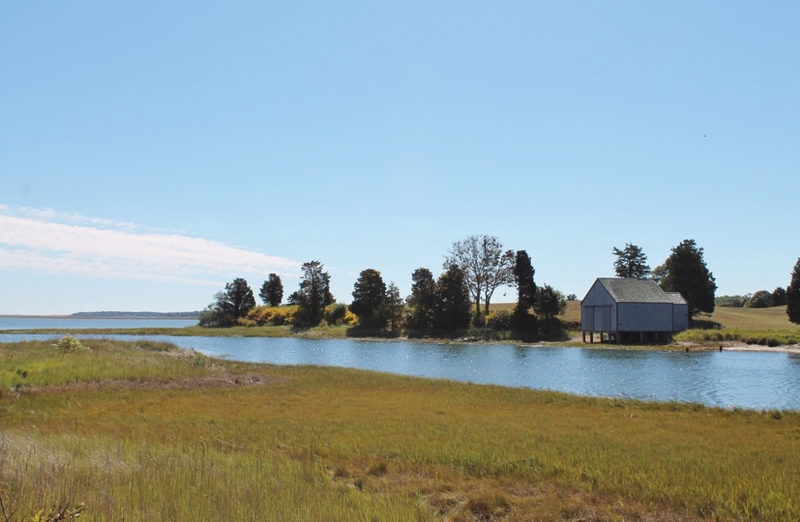 In addition to Coast Guard Beach and the Salt Pond Visitor Center, you’ll also find several walking trails in Eastham. The newly-reopened Red Maple Swamp Trail at Cape Cod National Seashore. Red Maple Swamp Trail: This trail reopened just in time for 2017 Memorial Day Weekend after being closed for several years. 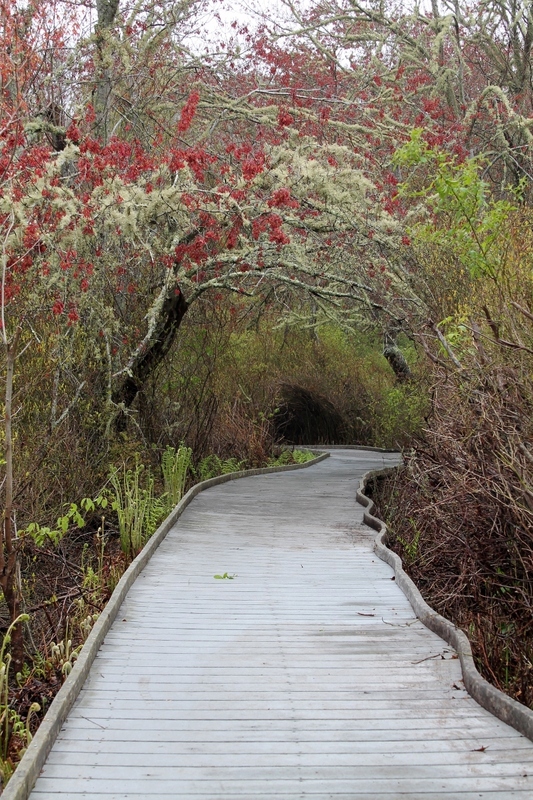 The newly-refurbished trail is actually a boardwalk that winds through a swamp filled with ancient red maple trees. Beautiful any time of year, the Red Maple Swamp Trail is spectacular in the fall. The eight-mile trail is an easy, flat walk, nearly all of which is over a boardwalk, making it perfect for strollers and wheelchairs. Park at Hemenway Landing for the easiest access. It can also be reached from Fort Hill, but this will double the overall length of your hike. 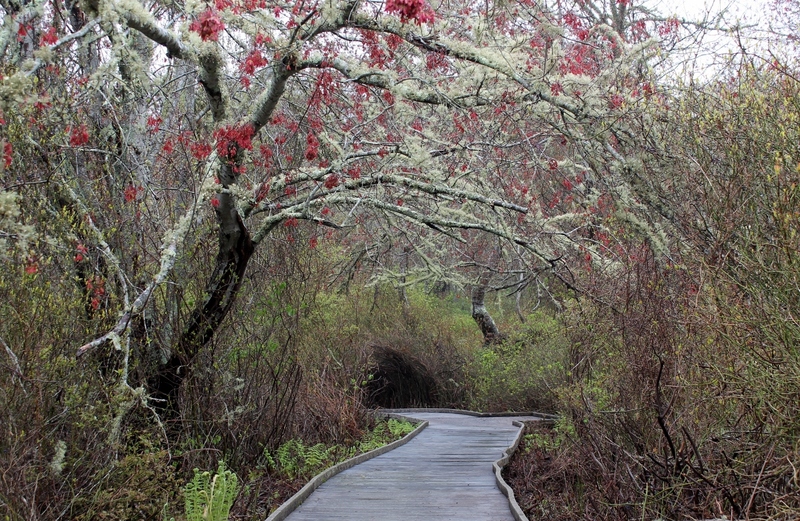 Nauset Marsh Trail: Hop on this trail from Salt Pond Visitor Center. A 1.3-mile loop over a flat, sandy path will provide multiple photo ops of the pond and Nauset Marsh, along with wildlife sightings galore. Post-and-beam footbridges will keep you dry as you traverse the marshier areas, but weather-resistant footwear is still a good idea, especially after a rainstorm. A 1.5-mile spur – just watch for the signs – leads across a wooden bridge and up to Coast Guard Beach. If your stamina allows, plan on adding the extra mileage to your hike. It is so worth it! Fort Hill Trail: Several acres of land originally owned by the Penniman family are now known as the Fort Hill Area. 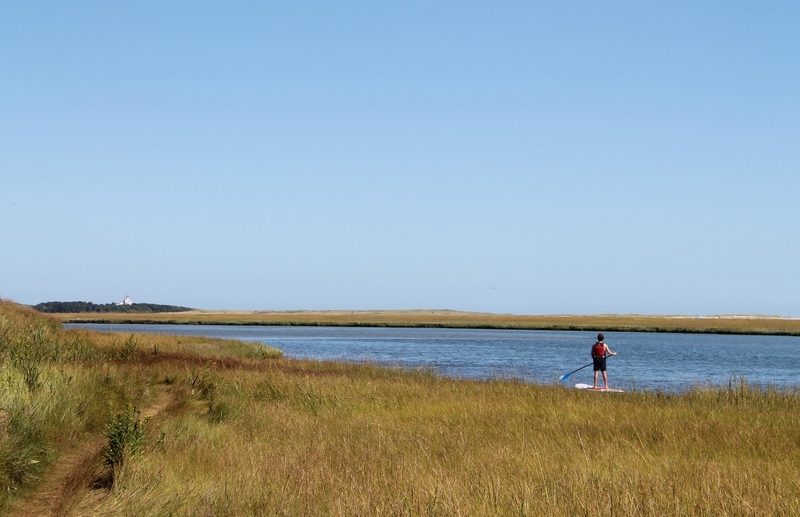 In addition to a hilltop parking lot that offers stellar views of the Atlantic Ocean and Nauset Inlet, you’ll find a one-mile trail that winds along the waterfront – this is a marshy area, not a beach – as it circumvents a large, open field. Further explorations will be rewarded with a view of the “sharpening stone,” an oversized boulder where early indigenous people honed their knives, and the Captain Penniman House, the home of the family that originally owned the area. The Captain Penniman House is open for tours on a sporadic schedule, but the grounds are open every day.